My exposure to Anna Sui cosmetics is quite limited. I had quite a few Anna Sui eyeshadows and I must say they are pretty good stuff. I don’t use them much because I’m fickle and flit around different brands and products often, but I do still like them. I also like the Anna Sui Full DX mascara for vava-voom lashes! However, I’d never paid attention to their foundations or base makeup. Recently, Tongue in Chic offered me a chance to try the new Anna Sui Moisture Rich Fluid foundation – newly available in August 2009 as part of Anna Sui’s Fall/Winter 2009 collection. I picked it up in BO-1 which is the 2nd lightest shade and is relatively neutral although there are beige tones. This makes it more suitable for Asian skintones. The frosted glass bottle is one of the prettiest I’ve seen! Just look at it – the signature Anna Sui rose. 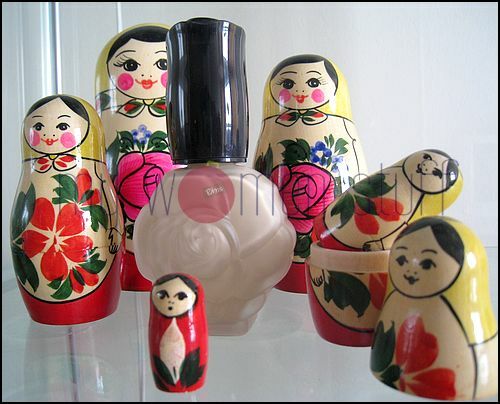 (doesn’t the rose match the rose on the Matryoshka doll?) The dispenser under the black cap is a pump which squirts out quite a lot in 1 pump. 1 pump is more than enough to cover my whole face. The texture of this liquid foundation is quite um… liquid. So it spreads easily and is light to the feel. I reckon from the name that it should not dry out skin and is rich with moisture. Truly, it did not dry out my skin and is said to contain anti-oxidant enriched botanical ingredients; but the oil control properties weren’t quite wonderful. Although I dusted my regular Lavshuca loose powder over it to set, I still got a little bit oily in the day. In terms of coverage, I find its light with sheer-medium coverage that you can build up by layering. It literally glides on my skin and is easy to blend – good when you’re in a hurry in the mornings. BO-1 fits my skintone quite well and evens out colour plus covering up redness so all in all, its a decent liquid foundation for those who like something light on their skins like I do. It won’t cover major imperfections though. There are 6 shades available in this new line but if you are very tanned or have dark skintone I don’t think you’ll find a good colour match. Like most Japanese makeup, Anna Sui caters more for the fair to medium toned. Colours look to be on the beige end of the spectrum so there’s no discernable warm or cool tone. A 30ml bottle retails for RM134 at all Anna Sui counters. Do you collect knick knacks? I love collecting knick knacks from my travels anywhere be it locally or abroad. The Matryoshka Doll or Russian Nesting Doll set above was a gift from my sister from her trip to Khazakstan. I haven’t been there myself, but that’s one “must have” crossed off my list! I wan to know when should I do touch up on my make up? when my face starts to get oily? and usually when ppl touch up what part do they concentrate on? Usually, if people touch up, its when they find their powder fading, they get oily, mascara or liner start to run etc. It depends on which part of your makeup is fading or running and you touch up accordingly. I personally do not touch up powder, just lipstick/gloss during the day. If I were to touch up powder on my forehead as that is the most oily part, should i blot away the oil first? I usually just touch up lipstick like what you do. my forehead and my cheeks will turn really red and oily by noon time, so will touching up with powder helps? Yes, blot away the oil else the powder won’t stick properly and can look cakey. Pat a piece of blotter or tissue on your skin then pat on compact powder to touch up if you like. I kinda like their base makeup products as the texture is light and make me feel like I didn’t make-up at all..
but seriously, not everyone love rose scent..
Take a huge huge sniff at the counter! Every Anna Sui product is scented with the rose scent so its hit or miss. Ooh you must have an extensive collection of coke cans and merchandise! I don’t collect them myself but I like seeing the coke cans from different countries – some are so pretty! Sounds like the powder foundation is good. I haven’t tried it and I’m a sucker for powder foundation anyway! Lovely bottle! Unfortunately anything that makes my skin oily is a no-no as I already have a super oily nose! Don’t really collect anything anymore since I have WAY too much junk! But I used to collect these small rubber balls that you can get from those American vending machines…go figure! LOL! Ya the bottle is so adorable but the oily factor was… sigh… a disappointment. Collecting rubber balls? That’s cute! You have to forgive me in advance for going abit off topic here. You mentioned in your article that beigy coloured foundation is more suitable for asian skintone. I’m trying to decide on which mineral (powder) foundation colour to choose from LovingMinerals and the decriptions they give makes it so confusing. I know I have a fairly light skintone with no noticable veins, so does that mean a beige coloured foundation would be most suited compared to ‘golden’, ‘warm’ and ‘neutral’? I’m so sorry for bombarding this weird question at you like this but I’m so confused. Are there any guidlines you use yourself when u make online purchases of foundations? I don’t have discernable yellow tones in my skin, nor golden tones. So, after a lot of trial and error I find that beige or neutral tones for foundation suit me best. I noticed that most Asian based foundation adopt a beige tone too. I sometimes love sheer coverage foundation, but the strong scent could irritate both my skin and my nose! thanks for sharing! I’m all about sheer for liquid hehe… do you have Anna Sui in Phillippines? i did get the to redeem Moisture Rich Powder Foundation sample through a Nuffnang ad, but its in B02, a bit darker than my skin colour. boohhhooo.. the texture’s great though. I love Anna Sui! Their products are so cute and the accessories are to die for! 😛 I have their liquid foundation which is the ‘Protective Fluid Foundation in P05’. Actually it doesn’t matches my skintone coz it does turns grey. ‘B02’ instead melts into my skin perfectly and doesn’t give me the grey cast. The ‘Protective Fluid Foundation’ dries up to a powdery finish and it’s best for oily skin. This is very good if you like a light to medium coverage as you do not need to apply powder after that. You can still apply pressed powder or loose powder but I just like it as it is. It’s light and not oily at all. hi i linked your review to my post here.